On Second Day, Anti-Government Protests Swell In Turkey : The Two-Way The protests began small, over a government effort to build a shopping mall in a park in Istanbul, but after a violent crackdown on demonstrators, the protests have become some of the largest anti-government protests in recent memory. Turkish protestors and riot policemen clash on Saturday, during a protest against the demolition of Taksim Gezi Park, in Taksim Square in Istanbul. "As International criticism mounts over the aggressive police tactics used on peaceful demonstrators in Istanbul, prime minister Recep Tayyip Erdogan says the protesters should go home. "Analysts say the heavy-handed crackdown which has left at least dozens wounded could damage Turkey's efforts to promote itself as a world tourist destination. Turkey is also in the running to host the 2020 olympic games." "When police broke up a four-day sit-in by people angered about redevelopment plans for a portion of Taksim Square, known as Gezi Park. 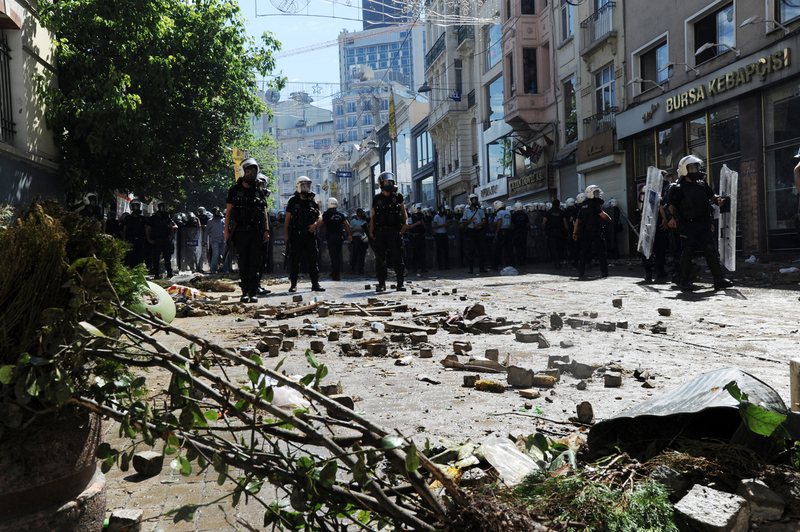 The Gezi Park protest started Monday after trees were removed as part of the redevelopment plan. The controversial redevelopment project is aimed at easing congestion around Taksim Square but also involves building a shopping center over Gezi Park." The New York Times reports that Erdogan asked protesters to take their issues to the ballot box. "Every four years we hold elections and this nation makes its choice," he said in a televised speech. "Those who have a problem with government's policies can express their opinions within the framework of law and democracy." "Turkish police began to retreat from a main Istanbul square Saturday, taking away barricades and allowing in tens of thousands of protesters in an apparent move to end tensions from two days of anti-government protests."